Black and white studio portrait of Antonia Pitton, taken in Vancouver, BC during the 1930s. Antonia Pitton (née Montico) met Antonio Pitton in Italy while he was serving in the Italian Army during World War I. The couple married in Italy and soon after Antonio migrated to Canada to set up a home for the family. Antonia Pitton migrated to Canada to join her husband in 1921, along with their young daughter Nellie. The family first settled in Paul River and then moved to Vancouver. 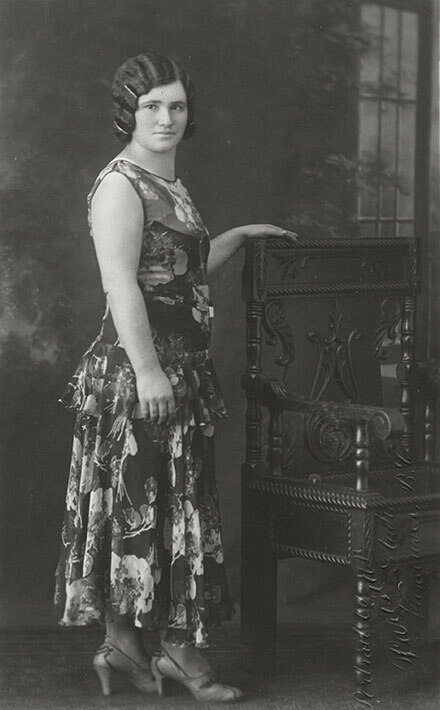 Nellie began working for the Italian Consulate in Vancouver during the 1930s. It is due to her work at the Consulate that Nellie was declared an enemy alien by the Canadian government during World War II. She was required to report monthly to the local authorities.